The book of essays pulled from the New York Times’s Disunion column has been out for a couple of weeks now. It’s a pretty hefty volume that includes over 100 essays on the period between 1861 and the beginning of 1863. My only complaint is that the table of contents does not list individual essays, which makes it difficult to locate specific topics. Included is my recent piece on the relationship between John Winsmith and his camp servant Spencer. I was also asked to contribute an essay specifically for the book on how it might be used in the classroom. That essay will be included in the e-book version, which is being marketed specifically to history teachers. You can read the essay for yourself below, but it goes without saying that I highly recommend it, especially if you teach American history and/or the Civil War. If your high school history class was anything like mine, your instructor relied almost entirely on an unwieldy textbook, with an even more unwieldy narrative – written as if intended to alienate as many students as possible from the serious study of the past. Historical understanding involved little more than the memorization of facts, employed in an essay that closely reflected the textbook and your instructor’s lecture. Step into a history classroom today, and much of what you see and hear will surprise you. Instructors have access to a wealth of primary and secondary sources, along with new digital tools, all of which have fundamentally changed what it means to study history. The ease with which history instructors can access historical documents is evident in the area of Civil War history. Broad access to primary sources like letters, diaries, legal documents, newspapers and photographs presents students with the rich and conflicting perspectives of the participants themselves, both notable and obscure. Websites like the Center for Digital History’s Valley of the Shadow project out of the University of Virginia, The Gilder Lehrman Institute of American History and the Freedmen and Southern Society Project out of the University of Maryland provide students access to the raw materials of historical study. These rich databases enable students to interpret topics and individuals for themselves, in a way that would have been impossible just a few short years ago. The availability of accessible primary and secondary readings – like those originally published on the New York Times’s Disunion blog, and now in the present volume — can supplement and even replace the standard history textbook. Such access couldn’t come at a better time. The past two decades has witnessed a dramatic shift in how the Civil War has been interpreted by historians. Fortunately, the meteoric expansion of the Internet offers historians new ways to share their work with the general public. Fresh interpretations of key historical figures and important events not only complicate the standard narrative contained in most textbooks, but introduce students to new questions to discuss and debate. This combination of fresh scholarship and easy dissemination online has helped to correct deeply engrained myths that for far too long were pervasive in high school history textbooks. Many of the articles contained in the Disunion book reflect this new wave of scholarship. No topic is more fraught with myth than the question of what caused secession following Abraham Lincoln’s election in November 1860, and the central role that slavery played in that disunion. Students confront black Northerners who did not support Lincoln’s campaign, as well as Virginians who questioned the logic of secession. The focus on individual stories not only reminds students that Americans struggled to understand the sectional crisis, but more importantly, that they could not predict its outcome. 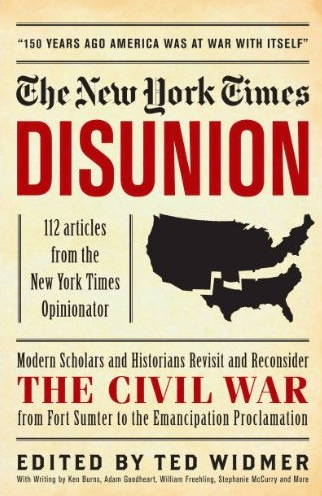 In the Disunion series, early battles and campaigns are given extensive coverage, but their place within the broader social, political and even international context is never lost. Battles were not isolated events during the war. Their outcomes touched all aspects of life in America and helped transform attitudes toward war and death, as well as the relationship between Northerners and Southerners to their respective governments. Instructors can make effective use of essays that illuminate the day-to-day life of the soldier, his ideological convictions and his emotional connections to family back home and comrades in arms. Arguably, the most valuable essays in this collection are those that chronicle the coming of emancipation. The complexity of emancipation and Lincoln’s role and motivation in this process can make it a challenge to continue to portray Lincoln as the “Great Emancipator.” Even more difficult to impart to students is the attitude embraced by many white Northerners that saw the institution of slavery as immoral, but racism and discrimination as natural. Disunion essays on this subject reflect the dramatic shift in historians’ understanding of emancipation that move beyond the narrow focus on Lincoln, beginning with the first fugitive slaves who arrived at Fortress Monroe in the spring of 1861, thus forcing its commander — and ultimately the Lincoln administration — to address the issue as a military necessity. Essays about the decisions made by thousands of slaves during 1861 and 1862, and the steps taken by Lincoln and the Republican Congress against slavery, offer students a much richer understand of emancipation. Although access to both primary and secondary sources on the Internet constitutes an information goldmine for both teacher and student, it does not come without challenges. Introducing students to digital sources must be accompanied by instructions on how to access and assess such information. Without such guidance, students are likely to find themselves on websites authored by individuals and groups whose agenda may have little to do with presenting accurate information. One need look no further than the hundreds of Civil War sites devoted to the so-called black Confederate soldier, which present doctored or uncontextualized “evidence” to support their claims. Without knowing how to separate out such material from legitimate sources, students are in danger of being led astray. While the responsible use of digital sources can introduce students to a wide spectrum of Americans who lived in the 1860s as well as recent scholarship, the growing use of social media tools in the classroom offers students new and creative ways to demonstrate their understanding of the past. Students can collaborate with one another on essays with platforms like Google Docs and introduce their own interpretations through video, blogging or the construction of a traditional website. In the past students were confined to demonstrating their knowledge and understanding through a traditional essay that was evaluated solely by the teacher. The creative use of this new technology brings students in direct contact with the general public. In doing so, it raises an entirely different set of questions that engages students’ critical writing skills and aesthetic judgment. The effective use of both primary and secondary sources, along with the embrace of collaborative and social media tools, can assist students in understanding that history is not simply the collecting of facts, but an ongoing discussion built on interpretation of primary sources, critical analysis and revision. Ultimately, our job as teachers is to encourage students to find meaning in their own lives through the study of what came before. The essays in this volume will surely bring us one step closer to achieving this goal through the close study of this nation’s defining moment.